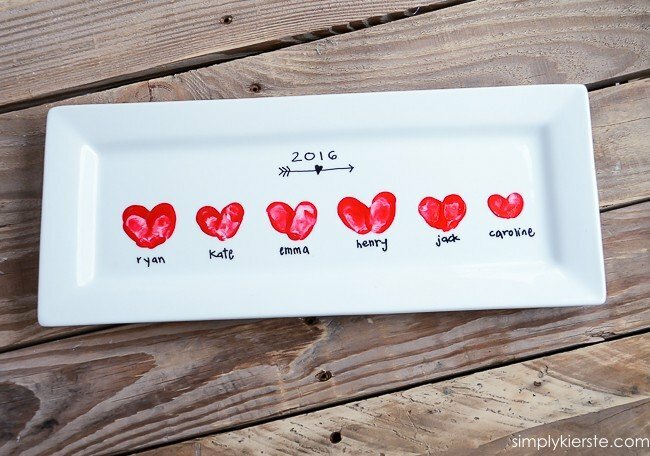 Heart Thumbprint Platter: Perfect for Mother's Day & Valentine's Day! I can never resist a really cute serving platter, but when you add adorable little thumbprints, there really is nothing cuter! 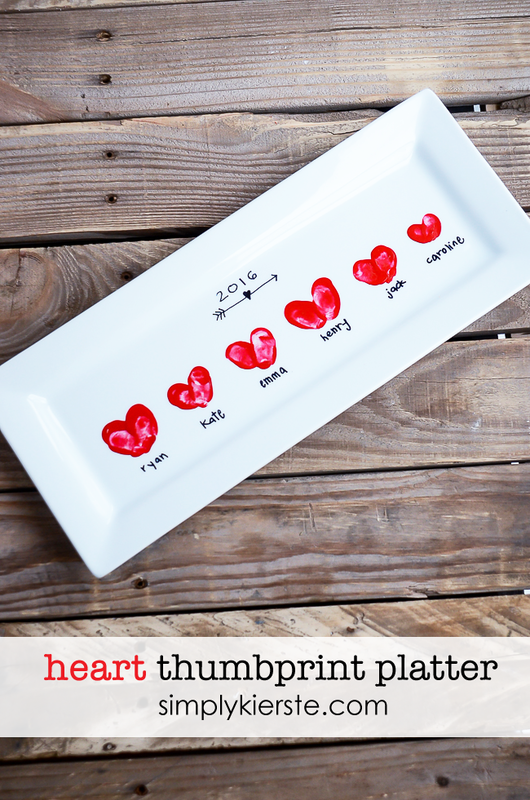 I absolutely adore my Heart Thumbprint Platter, and it makes me happy every time I look at it! So adorable, right? Not only is it darling, but it captures a moment in time that is so fleeting–it won’t be long before their fingerprints will be bigger. I love it. It would also make the perfect gift for grandparents and anyone who loves your kids! PERFECT FOR VALENTINE’S DAY AND MOTHER’S DAY! It would also be super cute Valentine’s Day decor–place it on a mantel, or the kitchen counter, on a shelf…anywhere! Think Mother’s Day, birthdays, and other special occasions…an adorable gift! I know any mom or grandma would love to have one of these…or anyone that loves your kids. SO QUICK & EASY TO DO! My six kids fit perfectly on this rectangular platter, but you could do round, square, oval, or whatever you like. Wouldn’t a mug be so fun too? Or a set of plates? The sky’s the limit! And it’s SO SO easy! 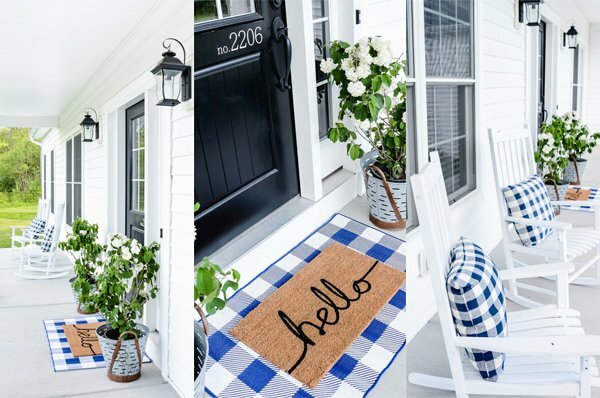 Even if you feel like you’re not a crafter, you can totally do this! There area also other options instead of a platter…how about adding the heart thumbprints to a planter? Or mug? The sky’s the limit! 3. Use the Sharpie to write the names, date, and any other text you would like. 4. Follow the curing directions on the paint you used. I used Martha Stewart Glass Paint (Habanero, which I love–it’s a great red!) and I could either oven bake or let it sit for 21 days. I’m super impatient, so I always choose the oven method! You can find the directions HERE. If you can’t find Martha Stewart glass paint, you can use a multi-surface craft paint that can be cured in the oven to be dishwasher safe. Plaid Crafts makes a couple of them, including FolkArt Multi-Surface Paint. With a multi-surface paint, you HAVE to cure it in the oven, not the 21-day option, if you want it to be safe in the dishwasher. If you’re worried about it being 100% food safe, then I would either put your fingerprints around the edges instead of the middle, or laying something underneath the food you’re serving. curious, I see white on the print as well is that from the dot you put for placement or a second fingerprint or white with the red paint? That’s just the white from the plate showing through the red fingerprint! What kind of sharpie did you use? I used just a regular, fine-tipped sharpie—it’s easy to write large or small!! It already has a gloss finish, so I’m wondering if baking it would ruin it. Yes–it was already glossy! The baking didn’t change the gloss at all. I hope that helps! I’m not sure if it would ruin it or not, I think it depends on what it’s made out of. Good luck! I couldn’t find a Gloss Habanero paint in the link that you provided. Can I use Satin Habanero instead. Will that look good? Any thoughts? We are trying to do this and have put names on first and now doing the paint – have just wiped off the print (was not good) but the pen has rubbed off….. now worried the pen is going to rub off – does the pen need a set amount of time to dry off??? You’ll need to let it cure, so it won’t rub off. There are two methods I mention in my post–one is the oven method, which I always do because it’s the fastest. The other one is letting it sit for 21 days. Such a great idea! I adapted it by using my own thumbprints to make a special gift for my wife for Valentine’s Day … and she loved it! And thanks for the instructions on how to cure the paint. That was extremely helpful! Woody, I LOVE that! I can see why your wife did as well–definitely a special gift and keepsake. So glad the instructions for curing the paint helped. Happy Valentine’s Day to the both of you! !